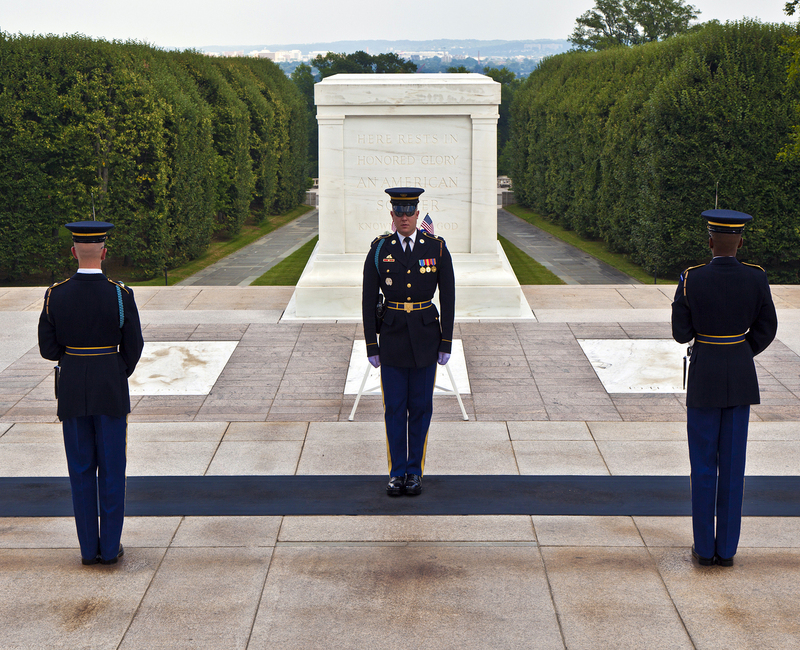 John I. asks: Is there anyone buried in the tomb of the unknown soldier or is it just all symbolism? It’s Armistice Day, November 11th, in the nation’s capital. It is a brisk day at Arlington National Cemetery. Dignitaries stand silently on the third anniversary of the ending of World War I, watching as a single white casket is lowered into a marbled tomb. In attendance is President Calvin Coolidge, former President Woodrow Wilson, Supreme Court Justice (as well as former President) William Howard Taft, Chief Plenty Coups, and hundreds of dedicated United States servicemen. As the casket settles on its final resting place in the tomb, upon a thin layer of French soil, three salvos are fired. A bugler plays taps and, with the final note, comes a 21 gun salute. The smoke clears and eyes dry as the Unknown Soldier from World War I is laid to rest; the first unknown soldier to be officially honored in this manner in American history. Even before the end of the war, the idea of finding a way to properly commemorate the lost, missing, or unable-to-be-identified French soldiers who died fighting for their country was conceived. Around November 1916, a full two years before the war ended, the city of Rennes in France performed a ceremony to honor those local citizens who were lost and unable to be found. Upon hearing of this ceremony, three years later, France’s Prime Minister approved a tomb dedicated to France’s unknown soldier to be installed in Paris. He originally proposed that the tomb be placed in the Pantheon, with other French historical figures like Victor Hugo and Voltaire (the latter of which made his fortune by rigging the lottery). However, veterans organizations wanted a location that was reserved solely for the Unknown Solider. They agreed upon a tomb under the Arc de Triomphe, originally completed in 1836 to commemorate other lost French military members. With the help of a 21 year old French baker turned “valiant” soldier named August Thin, a representative unknown soldier was settled upon. On November 11, 1920, his casket was pulled down the streets of Paris, before settling under the Arc de Triomphe, where he was laid to rest. To this day, the tomb is still there with a torch by its side, rekindled every night at 6:30 PM. Many countries worldwide adopted this symbol of commemoration, including the United States of America. In December 1920, Congressmen Hamilton Fish Jr. of New York introduced in Congress a resolution that asked for a return of an unknown American soldier from France for proper ceremonial burial in a to-be-constructed tomb at the Memorial Amphitheater in Arlington National Cemetery. The measure was approved a few months later for a “simple structure” that would eventually serve as a basis for a more elaborate monument. Originally set for Memorial Day in 1921, the date was pushed back when it was noted that many of the unknown soldiers in France were being investigated and may be identified, rendering them no longer qualified to be the unknown soldier. The date was then changed to Armistice Day, 1921. An important qualification to be selected as the “unknown soldier” is, of course, that the soldier is truly unknown, for they are meant to symbolize any soldier. Thus, there could be no ID on the body, no personal records of the deceased, no family identifications, and no information anywhere at all about who this person was. It also meant that certain precautions needed to be taken to make sure the selected would never be identified. For example, in France, when eight bodies were exhumed from eight different battlefields, they mixed up the coffins to make sure no one knew who came from where. When August Thin, the young soldier who was given the honor of selecting the Unknown Soldier, walked around the caskets and delicately placed flowers upon one of them, he legitimately had no idea who he was choosing. In Britain, six bodies were chosen from six different battlefields. Not told of any order to the bodies, Brigadier L.J. Wyatt closed his eyes and walked among the coffins. Silently, his hand rested on one- the Unknown Warrior. In America, the process was even more ceremonious. Four unknown Americans were exhumed from their French cemeteries, taken to Germany, and then switched from case to case, so not even the pallbearers knew which casket they were carrying. The honor of choosing exactly which casket was then given to Sgt. Edward F. Younger of Headquarters Company, 2d Battalion, 50th Infantry, American Forces in Germany. Placing one rose on top of the chosen casket, the Unknown Soldier was selected and sent to the U.S. on the ship Olympia. Later, that rose would be buried with the casket. Arriving on the shores of America, the casket was taken to the Capitol, where it was laid out under the rotunda. President Warren G. Harding and the first lady, Florence, paid their respects, with Mrs. Harding laying a wreath she made herself upon the casket. After visits from many notables and military, a vigil was kept overnight. The next day, the rotunda was opened up for public viewing. It was reported that nearly 100,000 people came to commemorate the Unknown Soldier. Around 10 AM on November 11th, the funeral procession began, passing by the White House, the Key Bridge, and the construction of the Lincoln Memorial (which would be finished six months later). Arriving at Arlington National Cemetery and the Memorial Amphitheater, the ceremony began rather quickly. In fact, it was reported that the President, who was traveling by car, got stuck in a traffic jam on the way there and would have been late if it wasn’t for his driver’s quick decision to cut through a field. The beginning of the ceremony featured the singing of the National Anthem, a bugler, and two minutes of silence. Then, President Harding spoke, paying tribute to the Unknown Soldier and asking for the end to all wars. He then placed a Medal of Honor upon the casket. Congressman Fish followed with laying a wreath at the tomb. Next, Chief Plenty Coups, Chief of the Crow Nation, laid his war bonnet and coup stick. Finally, the casket was lowered into the crypt as the saluting battery fired three shots. Taps was played (see: The Origin of the Military Song Taps) with a 21 gun salute at the end. The ceremony for America’s first Unknown Soldier was finished. Today, the Tomb of the Unknown Soldier in America is under ceremonious guard 24/7, with the changing of the guard happening up to 48 times a day. It is truly one America’s most somber, affecting, and patriotic memorials. Don’t walk or talk during the changing of the guard and by all means do NOT go beyond the rope. Such a long answer! Didnt have time to read it all! I was at Arlington National Cemetery in 2005 and had the honor to see the Tomb Of The Unknown and watch the Changing Of The Guard. It was somber to say the least but my heart was swollen with pride. The precision, dignity and respect shown as these men go through the ceremony brought a pride that’s difficult to describe. I had some pictures of that day and perhaps I can come back and post them. God Bless America and the men and women who have served and given the ultimate sacrifice. I went there in 2012 and it was really cool to see! Do not walk near or on the tombs, do not walk on or near the steps leading to the tombs, do not cross the railings or fences, do not sit, speak, laugh, giggle or use a cell phone during the changing of the guard ceremony. Disrespectful moronic idiots who break the rules SHOULD be slapped, fined or punished in some way, shape or form! A constant of silence and respect should and must be maintained at all times in honor of those unidentified men who gave their lives so that all Americans can live the life they have freely each and every single day! Hahahahahaha, this is spot on. It’s like when people rage about Americans burning the flag as it’s disrespectful to all those who fought and died for our freedoms, but then those same raging individuals are trying to restrict the freedom of the flag burners for no other reason than that what they’re doing is disrespectful. But which one is really more disrespectful? To me, it shows more respect when you honor and defend other’s freedoms that go against your own thoughts and views on something. People have the right to be jerks.But,as that right was paid in full and defended each day by people like my father in the second world war.JERKS!,should be with the same amount of reasoning behavior they show. Likely, they are people that are young or who have never worn their country’s uniforms and sworn the oath. Pity them, for they know not the true measure of service to one’s people. So, if it is currently vacant, where are the remains of the unknown soldiers from WWI, WWII, and Korea? I believe only the crypt that once contained the Vietnam soldier is now empty.